Although I turned 25 this year, I'm still a big kid at heart and I still get really excited about Christmas! Doesn't everyone though? Because I'm still a big kid, that means that every year I like to put a little wishlist together of everything I want Santa to bring me! I'm probably not going to show this to my family and will just ask for the money but I will definitely aim to buy most of these myself with my Christmas money instead! I did recently create a wishlist for a MrLista competition and although I still want everything on that list, I thought I would do a more reasonable wishlist with things my family might actually buy me! 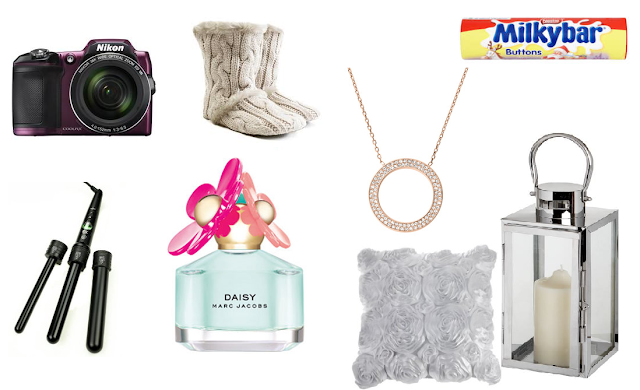 I noticed when I was making this wishlist that a few of these have featured on wishlists before - oh well! I would definitely like a new camera as my old one isn't much good but I'm hopeing to bag on in the sale so that might have to wait! Staying with electricals, I would love a new set of curling tongs. The ones I have now are slightly too thin and give my hair a very tight curl and I would like looser curls. Next is the obviously big fluffy slipper boots and yummy chocolate. They are both a definite must for Christmas Day and I think I would slightly heartbroken if my mom didn't buy me either. Yes, I'm a child! As well as these, my mom usually always buys me a new perfume and this year I would love any of Daisy perfumes from Marc Jacobs. Any of them will do - I'm not fussy! I have recently decorated my bedroom (post soon!) and my colour scheme is a lot more neutral and calming so all of my bright pink and purple decor will now unforunately have to go. This does however mean that I can now go and buy all new decor including the pillow and lantern pictured that I've been eyeing up! Lastly on my wish list is the gorgeous rose gold circle pendant from Michael Kors. How gorgeous is it though?